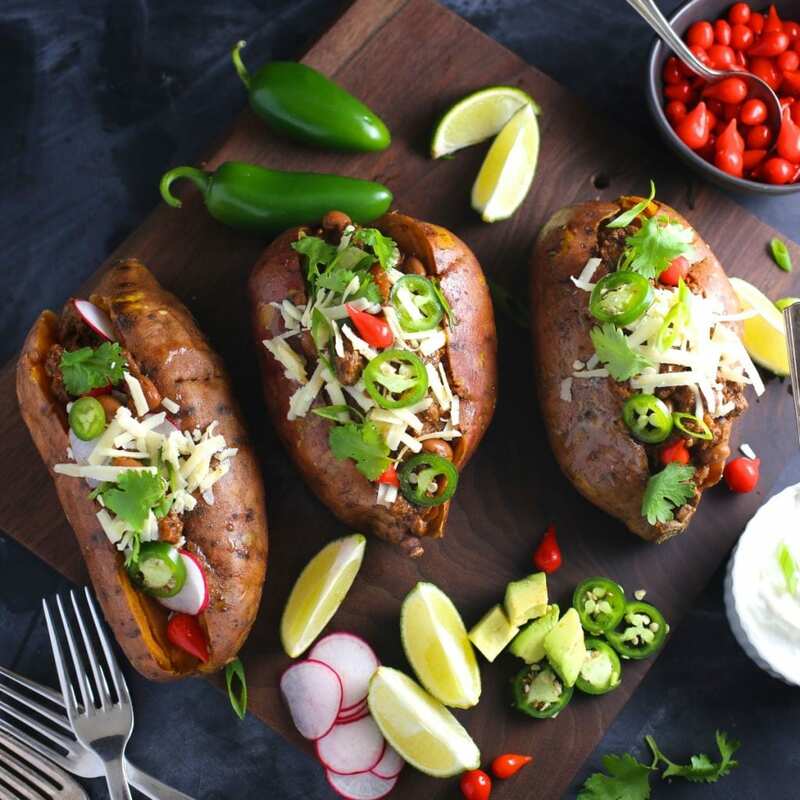 Chili sweet potatoes are our go-to for a rainy fall weekend – we give you a few meat and meat-free options, but they’re all tasty. I’m a film editor and several times over the span of my career, I’ve thought about moving from New York City where I was born, to Los Angeles. Many of my friends and colleagues have done it, and most of them love it there. It’s so beautiful, they say. True, I’ve been and it’s very pretty. There’s a lot more work and for the price of a Brooklyn studio, you can buy a three bedroom house with an avocado tree in the back! All true and, yes, this makes me jealous. And the best part? It’s warm all the time and it never rains! Aaaaaand you’ve lost me. For me, one of the great joys of life is feeling the crisp, cool air of Fall. When the weather turns it feels like a shock, every time. Even better if that cool air comes with a blustery rain storm. The type of weather that practically forces you to cook something warm and comforting. To stay home and watch movies or play video games all day. (Nerd note: Matt and I are re-playing “The Last of Us” and, oh my god, it’s so good). 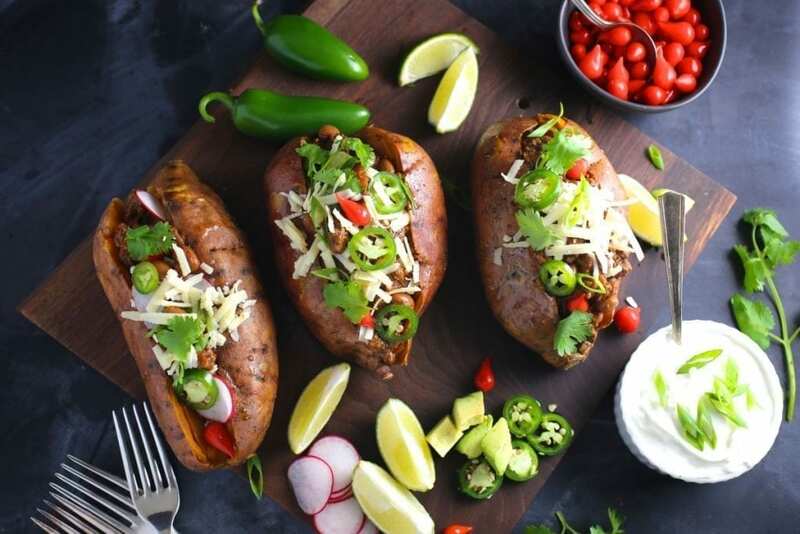 When I heard it was going to turn cold and rainy last weekend, I knew right away what I wanted to make; spicy chili with all sorts of yummy toppings stuffed inside a baked sweet potato. The chili is flavored with cumin, two types of chili powder, jalapeños, garlic and dark chocolate. Also maple syrup and beer, not shown. I initially wanted to use Ancho and Pasilla chili powders, but the the Pasilla turned out to be hard to find up here in the Hudson Valley so I substituted a blend. 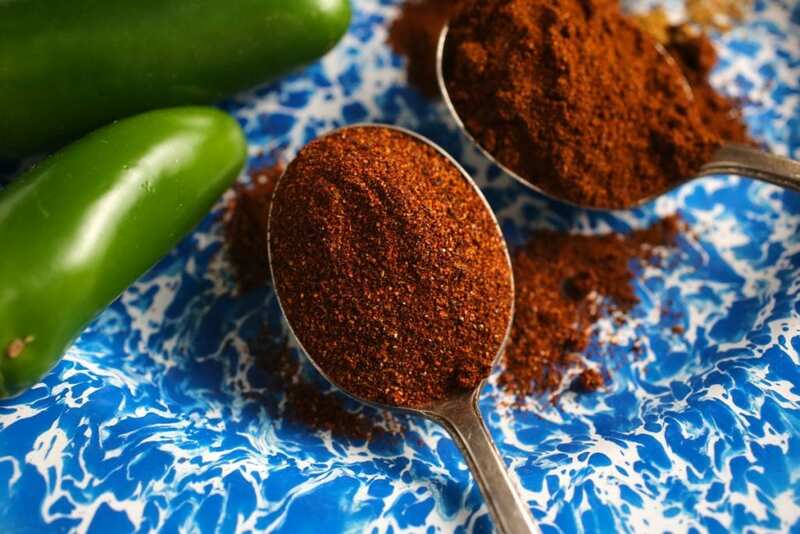 Ancho chiles have a mild fruity, sweet, slightly smoky flavor that I just love but if you find a good blend that you like, you could just use that. Most of them include Anchos anyway. Of course, this chili would be delicious on top of rice, on in a big tray of nachos, but I wanted to go the healthier route and the sweetness of the sweet potatoes is a great combination with the rich, spicy chili. 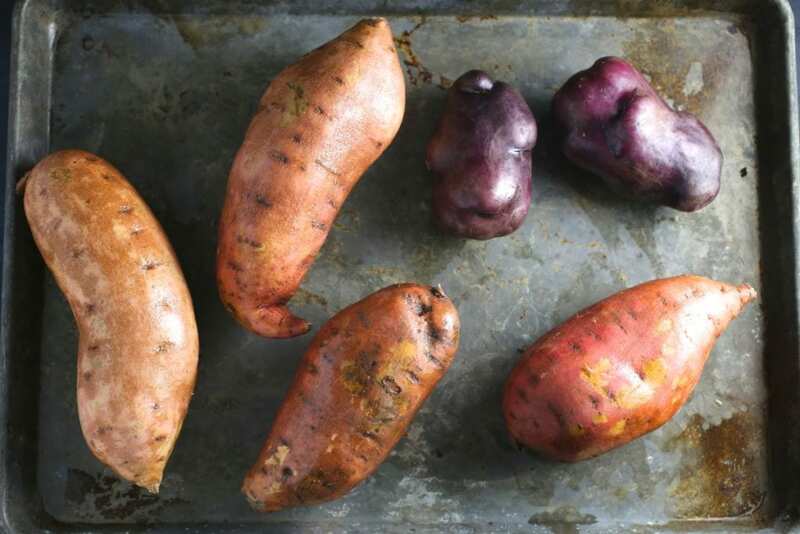 Two kinds of sweet potatoes (orange and purple). 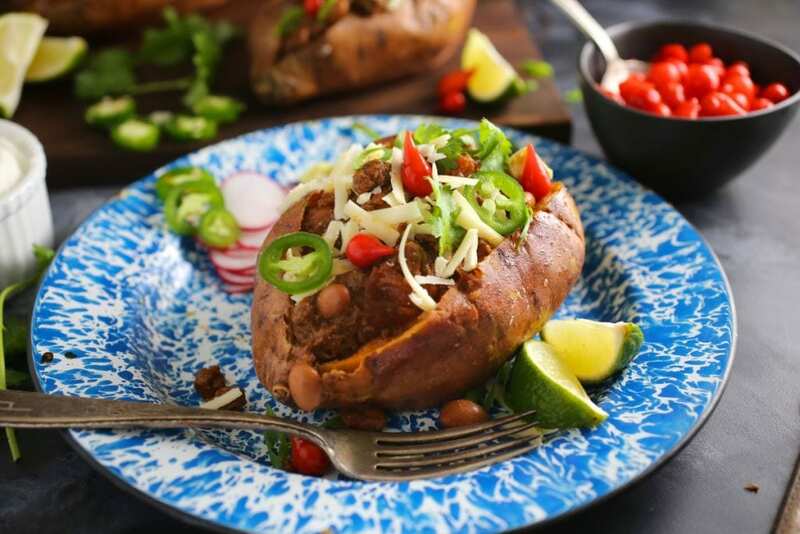 Note: Our chili sweet potatoes can be made either with beef or turkey or completely vegetarian / vegan (direction in recipe below). For the vegetarian version, we like a combination of pinto and black beans but red kidney beans are also a good option. If using meat, try to find coarse ground. It results in a better texture. If you don’t see it at the store, ask your butcher to grind some for you. For beef, you could also buy a whole chuck steak and dice it into small cubes. The chili can also be cooked in the oven (325ºF/160ºC) for 1 hour covered, 1/2 hour uncovered, stir occasionally. Or in a slow cooker (crockpot). Transfer the mixture to the slow cooker, cover and cook until the chili thickens and the flavors meld, about 8 hours on low or 6 hours on high. If you like things really spicy, add two chipotle peppers in adobo to the mix. You could also add a 1/2 teaspoon cayenne pepper. Scrub the sweet potatoes well and pat them dry with a dish towel. Place on a baking tray and drizzle a very small amount of vegetable oil. Using your hands, rub the oil in a thin, even layer all over the potatoes. Prick each sweet potato with a fork a few times and put them into the oven to roast. Depending on the size of your potatoes, they may take between 30 minutes to 1 hour for them to cook. Check at 30 minutes by squeezing a potato (using an oven mitt!). You can also insert a sharp knife or fork into the center. They should feel quite soft and the knife should easily glide all the way through. If not return to the oven and check again in 10 minutes. When done, cover tray with foil and set aside. In a large, heavy pot or enameled cast-iron dutch oven, heat the oil. Add half of the ground meat and cook over high heat, breaking it up with a wooden spoon, until browned, about 5 minutes; transfer to a bowl with a slotted spoon. Brown the remaining ground meat and add it to the bowl with the first batch. Drain all but 2 tablespoons of oil and add the onions and jalapeños and cook over medium heat, stirring occasionally, until the onions are translucent, about 8 minutes. Add the garlic, tomato paste, chile powders, cumin and black pepper and cook for 5 minutes, stirring occasionally. Add back the meat (if using) and stir in the broth, beans, diced tomatoes, maple syrup, beer, and vinegar. Bring up to a boil, lower the heat and simmer, covered, for one hour, stirring occasionally. Remove cover and simmer for 30 minutes longer, until chili is thick. Turn off the heat and stir in the chocolate until it’s fully melted. Add the lime juice, season with salt to taste. Slice open a sweet potato, season with salt and pepper, and mash the flesh gently, forming a pocket. Add about ¼ - ½ cup chili to the center and top with your favorite toppings. While I do live in SoCal, I also miss the rain, and storms, and fall weather. It’s over 100 here today, which is just plain wrong. This looks great. These look so yummy! 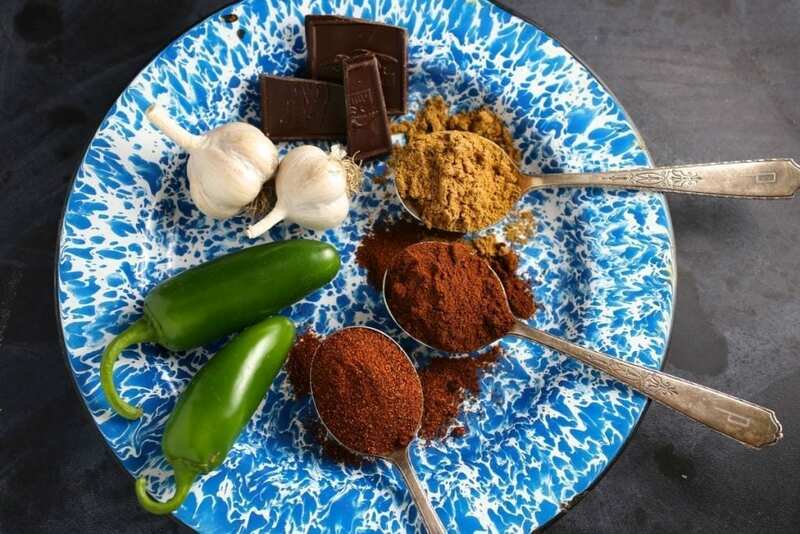 I love that you put chocolate in your chili:) Great pics, too!